July 25, 2017 By Roddy Russell Jr. Welcome to this week’s AfterFacts It was a double-match week at Yankee Stadium. Four points out of a possible six against the top two teams not only in the East, but in the league? Not bad at all! Let’s talk the midweek game first, get the negatives out of the way. 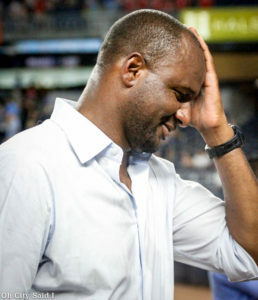 Patrick Vieira wasn’t happy with the way NYCFC performed in the game against Toronto. 1. NYCFC drop points again after conceding a fifth goal in the first 15 minutes of a match, one in each of five matches. The record across those matches is 2W-1D-2L (7 points out of 15). 3. The Blues remain unbeaten against The Reds (well, Toronto “Reds”) in regular season play: two wins and four draws. In these six matches, City outscore Toronto by 13-9. That is a total of 22 goals in six matches for these two clubs. That should make these match-ups with Toronto exciting for neutrals. 5. The come from behind win-streak is over. It only lasted three matches (Philadelphia, Seattle, and Minnesota). Alright, enough about this. On to Saturday’s Chicago match. 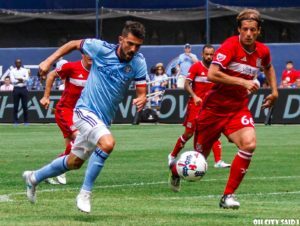 Despite playing most of the match with 10 men, NYCFC managed to pull off the win. 6. This match could be considered a mini-“throwback” to July 7, 2010, when David Villa with Spain played against Bastian Schweinsteiger and Germany in a 0-1 victory in the 2010 World Cup Semifinal in Durban, South Africa. Spain went on to win the Cup that year against the Netherlands. Schweinsteiger had to wait only until the next World Cup to get his. 7. As stated in the broadcast, Villa scored the club’s 150th MLS goal. The man just can’t stop making history! 8. The 151st goal was scored by Frederic Brillant, who now sits at a goal differential of 0 (sorry, let’s not talk about that…why did I bring that up?). 9. Now, yes, City has 151 goals since the start of 2015. But so do the Red Bulls, unfortunately, and surprisingly since their season has not been great. But it’s the Hudson River Rivals that lead the league in goals scored since 2015. 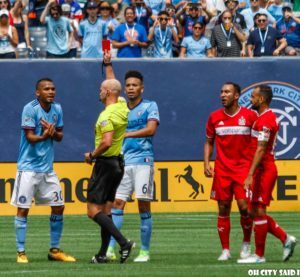 Yangel Herrera earned NYCFC’s first red card of 2017. 10. It took a while, but the first red card of the season for NYCFC goes to Yangel Herrera. Definitely questionable, but I expect Patrick Vieira to still have a little chat with Herrera about keeping a cool head when sitting on a yellow card. Nothing too serious, though. 11. The Blues’ record against the Fire improves to 3W-2D-1L. Also, City are undefeated against Chicago since Vieira took over last year (3W-1D-0L). Good week for City. Could have, would have, should have been six, but four is next best. Can’t argue with that. Next week, City faces the number one in the league, Toronto FC, at BMO Field.